I'm so excited to take your Highschool Graduation Portraits! 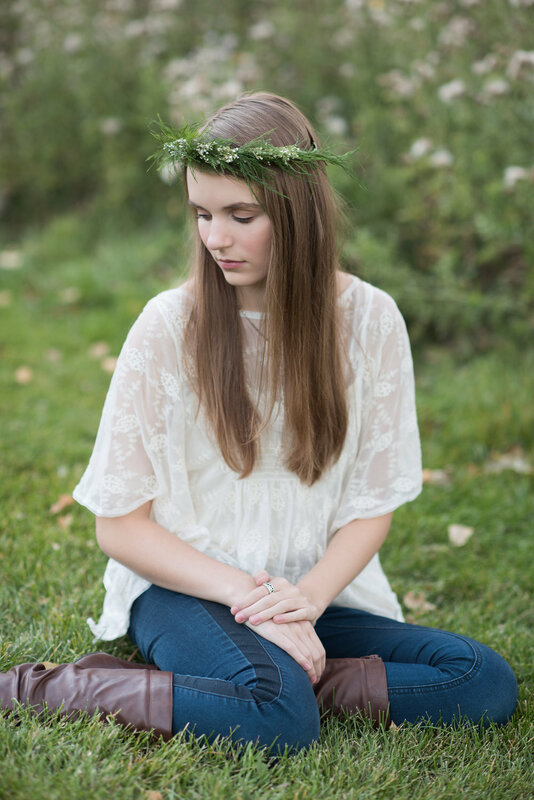 Your session is going to be fun and together we are going to create some amazing photographs of you! But before your session there are a few things to think about and a few things you need to bring to your session. This is a very special time in your life and I want your portraits to capture who you are. How you dress is a reflection of your unique personality so I really encourage you to give your clothing choices some thought and planning. I want you to look your very best, so to help you with this I've compiled a list of suggestions and tips. For a graduation session I usually suggest 2 or 3 different looks. For your first outfit I would suggest bringing something dressy. If you are doing your session in the fall of your Grade 12 year you may not have your prom gown yet. If you do, it would be great to wear, if not wear another dress. If you are doing your session in the spring of your Grade 12 year then definitely wear your prom gown!! For your second outfit I usually suggest something casual, like jeans and a pretty blouse, or a cute sundress and jean jacket. You could also bring along another dressy dress if that's what you like. 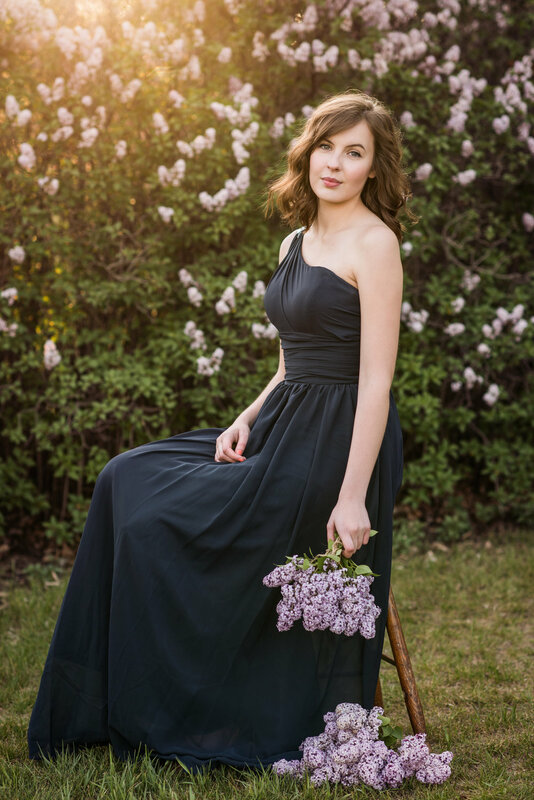 I specialize in creating very feminine portraits and dresses are always a great look, but the choice is totally up to you and what you feel most comfortable in. If you choose to be photographed in a third outfit it can be whatever you would like, but a good choice would be a sports or dance outfit if you are involved in those types of activities, or you can even choose to wear one of my cap & gown sets. I also can create a special couture / fashion for you if you would like to try something different. One very important rule is to only bring outfits that are fitted. Fitted clothing is better than loose, flowing clothing because fitted clothing shows your shape, whereas loose clothing can actually make you look big and bulky. Try to avoid bulky sweaters and loose flowing cardigans. If you aren't comfortable with the way your arms look arms choose clothing with sleeves, at least 3/4 length. Bare arms draws attention away from your face and can make your arms look larger. Choose clothing that you love, make you feel and look good, and expresses your personality! A simple rule to remember is that white and bright colors stand out and makes things look bigger, but black and dark muted colors hides things and makes them look smaller. This means that dark clothing is slimming and doesn't draw attention. Feel free to choose clothing in your favorite, most flattering colors. Really bright colors, neon colors, as well as red, orange, and hot pink don't photograph well, so try to avoid them. 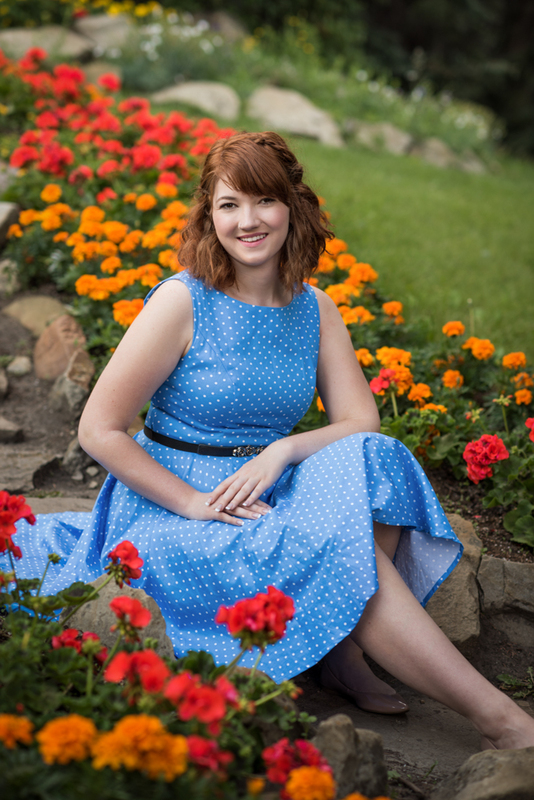 Neutral colors always photograph well, especially if you are having your portraits done outdoors. I highly recommend them and are my first choice! I highly recommend choosing solid colored clothing most of the time. The right pattern can work, but in general, patterns tend to draw attention away from your face. If you aren't sure please feel free to send me a photo of your outfit and I can help you decide. Please avoid clothing with graphics on them, such as cartoon characters, big logos and labels. These definitely draw too much attention. 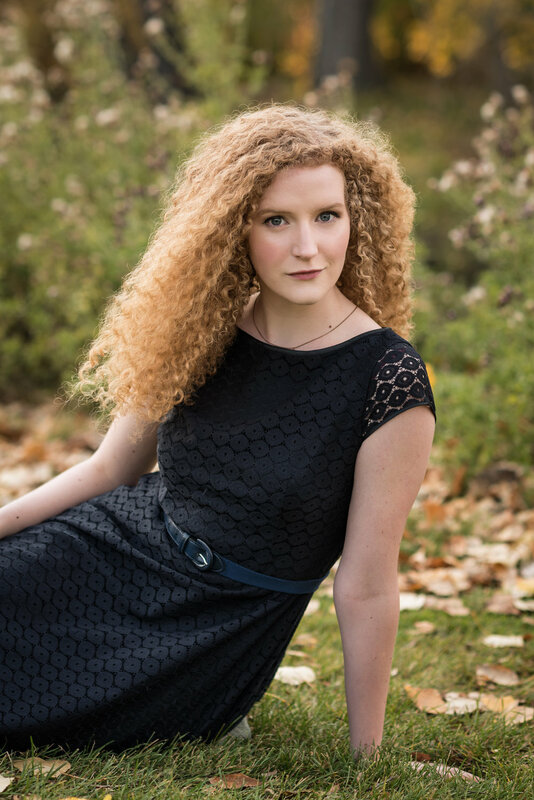 Hannah had an oudoor grad session in the fall of her Grade 12 year so she went all casual. She wore jeans and brought tops in a variety of styles to create different looks. She also brought a leather jacket and I brought floral props to change it up. Alisha had an indoor sessison after her graduation so she wore her prom gown and one of my studio tulle skirts to create a ballet look because she's a dancer. 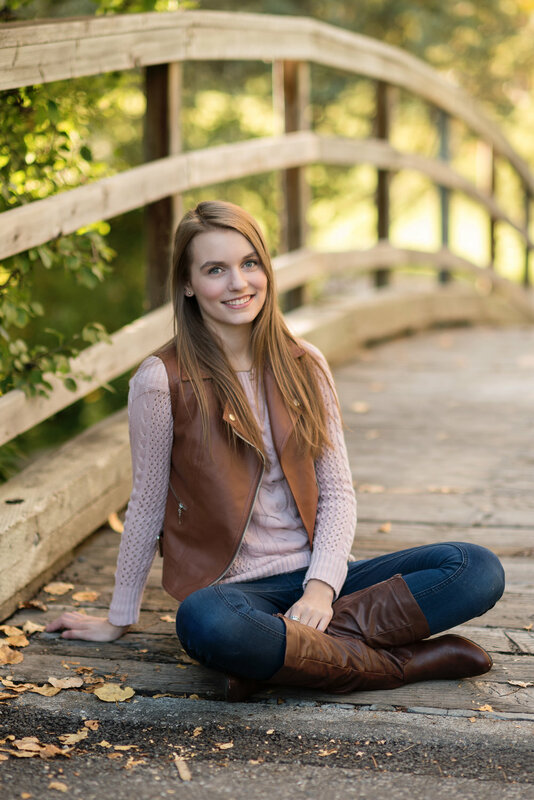 Jacey had an outdoor session a couple weeks before her graduation and she chose to wear only one outfit, her grad gown. She's a musician so she brought her cello. 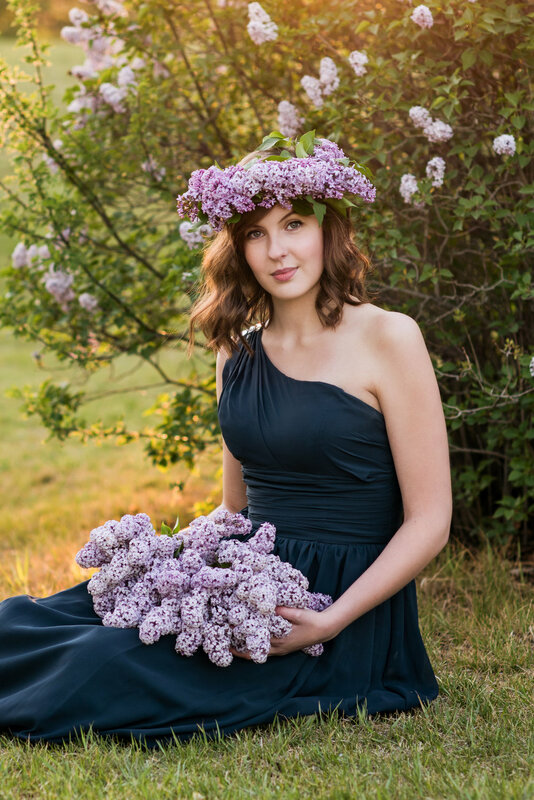 And of course since the lilacs were in bloom we used them in her portraits. I made her a flower crown and a bouquet. Petra had an outdoor session in the fall of her Grade year. She only wore two outfits but she brought a wrap to change up her look. I brought a flower crown for her. Emma did her session during the summer after her graduation. 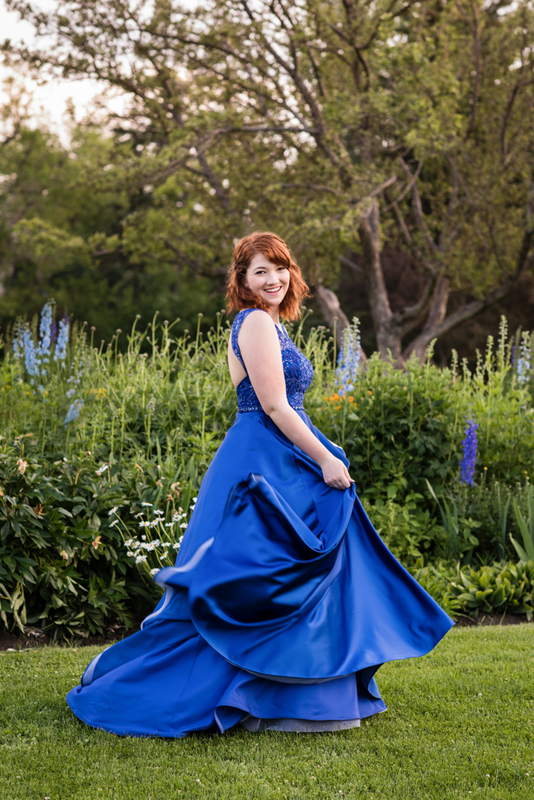 She wore a pretty casual dress and then changed into her prom gown. I also brought flowers to her session. 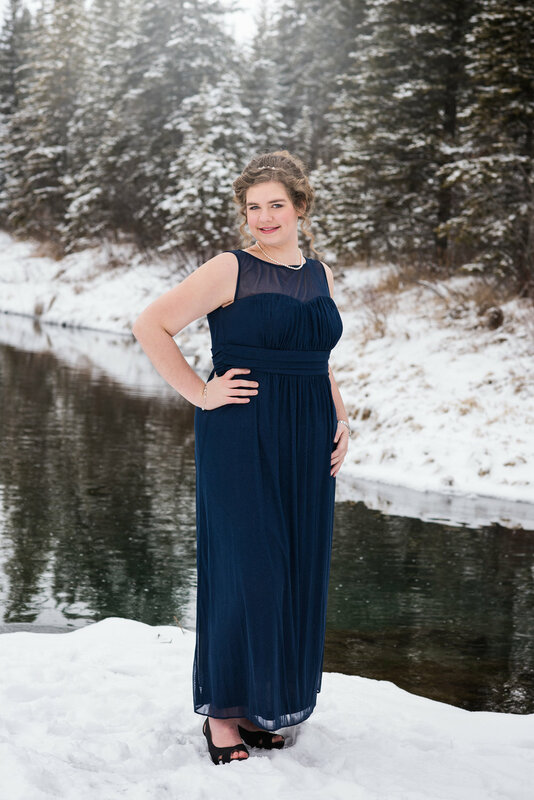 Kristina always dreamed of having winter graduation portraits so we went out in the winter in her grad gown! She brought a warm fuzzy coat to keep her warm and to change up her look. I even brought a few flowers to match her dress and the winter theme. Hannah came back to do photos in her grad gown about a month before her graduation. 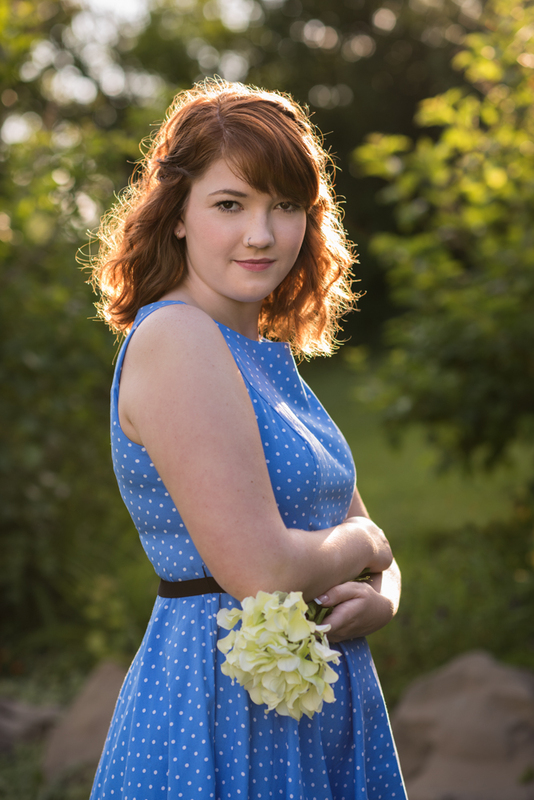 She had her hair and makeup test that day so she booked her portrait session for the same day. 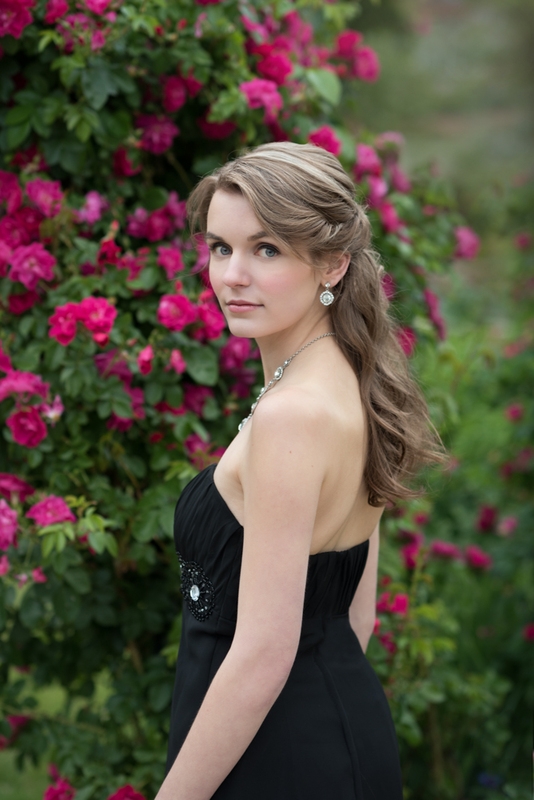 She only wore one outfit, her grad gown, but we did some of her session indoors, and then went outdoors on-location to a beautiful rose garden. For more inspiration you can do a Google image search for "senior portraits", or "senior photography". Look at the images and you will usually get an idea of what you like and what you don't. Another place you can go for inspiration is my Pinterest page where I have lots of articles and clothing color examples. Another great resource is Senior Style Guide on Instagram (seniorstyleguide). Here's a little inspiration from them! My goal is to create 20-30 different images of you so that you can fill up one of my beautiful keepsake folio boxes. With this in mind I like to photograph you in at least two different outfits to create a variety of looks. You can also bring along accessories and props to vary your look. When choosing clothing think of adding textures, layers and accessories because they show off your personality and add visual interest to the portrait. They can also provide a way to create a variety of looks during your session. The challenge is to have these things complement you but not overwhelm, so don't overdo this. Create layers with sweaters, hoodies, jackets, vests, etc. You can also bring accessories like hats and scarves if you like them and if they complement your outfit. Jewelery that complements your outfit is recommended, but again, be careful it doesn't draw too much attention away from your face. I generally recommend not wearing a watch unless it's really important to you. Bring any props you would like to include in the portrait, like musical instruments, sports equipment, books, dance shoes, etc. I often bring flowers to sessions. If you are having an outdoor session don't forget about footwear! Boots are a great choice and come in a variety of looks. I really discourage runners, sneakers and white socks. If you are having an in-studio session you don't need to worry about bringing footwear. Professional makeup is included in your session, but some people prefer to do their own. I cannot stress enough the importance of wearing makeup to your portrait session. It really does make a huge difference in how your portraits will look. If you don't normally wear makeup that's okay, however I highly recommend that as a minimum you wear a good foundation (not a tinted moisturizer) to even out your skin tone and cover any blemishes, as well as lip balm to make your lips look soft and moisturized. If you have chosed to do your own makeup please see my Makeup Tips page for additional information. Professional hairstyling is also included in your session, but if you prefer to do your own I recommend wearing your hair in a style that is normal for you. 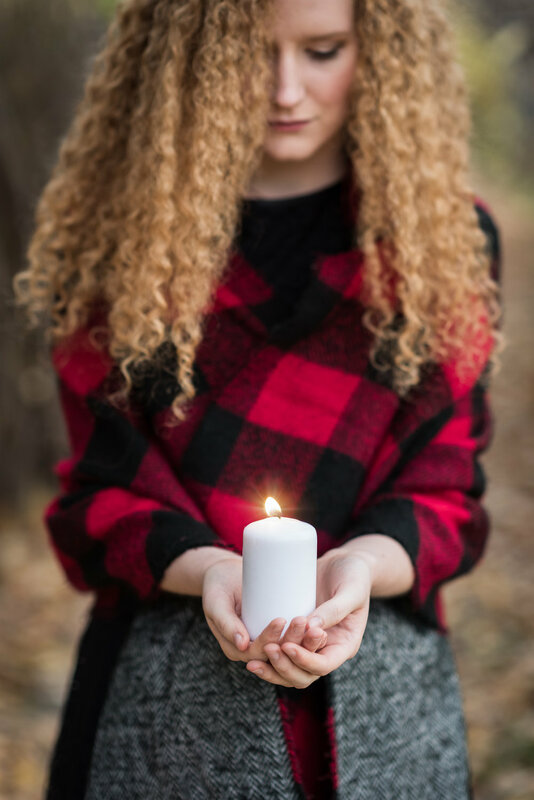 Keep in mind that if we are doing an outdoor session that Calgary can be a windy place, so take that into consideration and come prepared for fix ups. Haircuts should be done at least 2 weeks before your session. This gives your hair to grow back slightly. I don't recommend making any drastic changes at this time. Just stick with a trim and a color touch up if necessary. Your lipstick, and your lip balm or lip gloss for touch ups. I sometimes use fresh flowers as props, and I always have snacks at your session, so if there are any other allergies I need to be aware of please let me know. Any personal props you would like included in your photograph, such as musical instruments, books, etc. And please feel free to bring one guest along with you, like your Mom, sister, or a best friend. It's always nice to have someone there to visit with during down time. I do not allow any cell phone photos taken of my sets during the session, so please make sure your guest is aware of this. For on-location sessions please bring comfortable shoes for walking. We will be walking around to various locations during your session so if you are not wearing shoes that are suitable for this please bring along an extra pair of comfortable shoes that you can slip into. For on-location sessions please bring a jacket. Outdoor sessions are scheduled 2 hours before sunset, so by the end of the session it can be cool, even in the summer, so bring a jacket. During the spring and especially in the fall the weather can be changeable here in Calgary, so please dress for the weather. 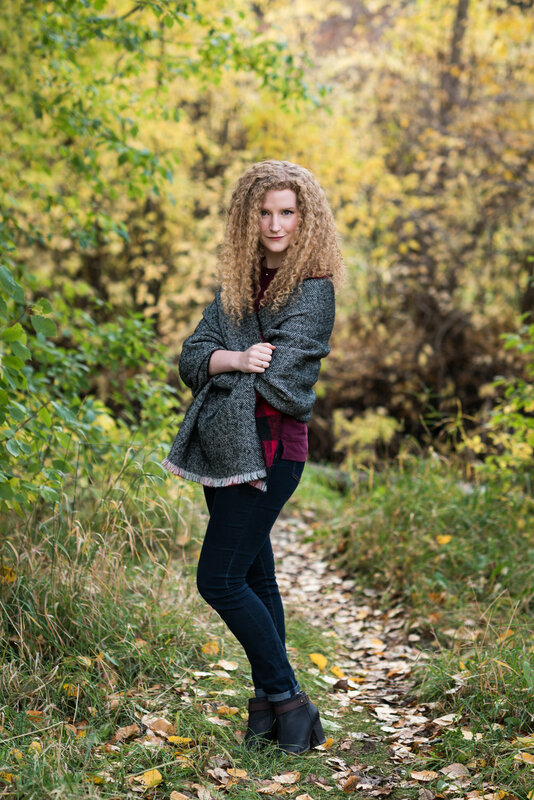 You probably don't want to be photographed in bulky sweaters and coats, but bring one along so that you can slip into it when there is some down time during your session. I want you to be comfortable! 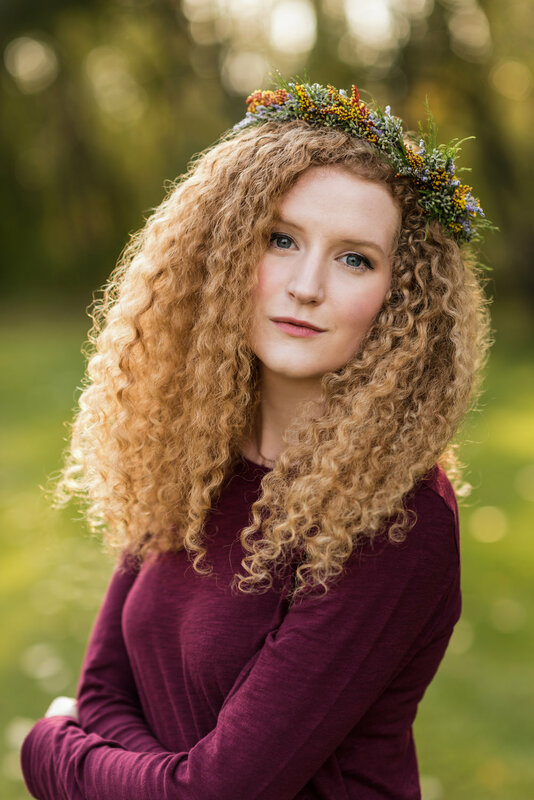 For on-location sessions please be aware that your session will take place in fields with grass and various trees and flowers, so if you have any allergies you may want to take allergy medication before the session. You don't want to be sneezing, itching and have red, watery eyes during your session.